IPEVO have kindly sponsored The London RE Hub Conference and provided us with a selection of prizes for a post-conference blog competition. Quite simply, the London RE Hub team will choose the best write-ups of the Conference to be awarded prizes. They can be summaries of your learning, an overview of the day, an account of a particular session, your lasting thoughts, "Where next?" or anything else you want to write about! The teams decision is final. The deadline is Monday 16th May. 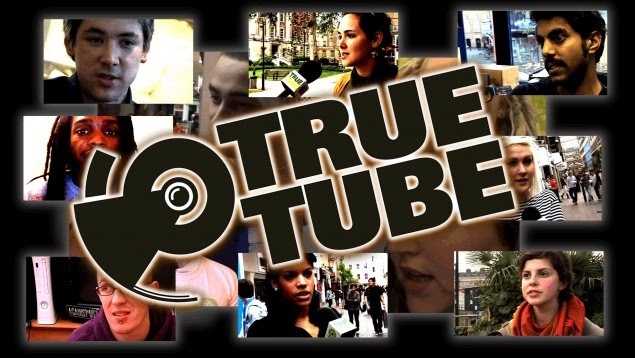 Please email any entries to TheLondonREHub@gmail.com - please provide a link to your own blog or all relevent text / images to be uploaded to: http://thelondonrehub.blogspot.co.uk/ - you can always let us know if you have a prize preference too (but we can't guarantee it). One of the aims of The London RE Hub was to better connect RE teachers and any organisations or individuals who wanted to support them. We've been asked to share this exciting new opportunity for teachers in Camden and Islington. The Jewish Museum London is hoping to help set up a new NATRE group for the boroughs of Camden and Islington. 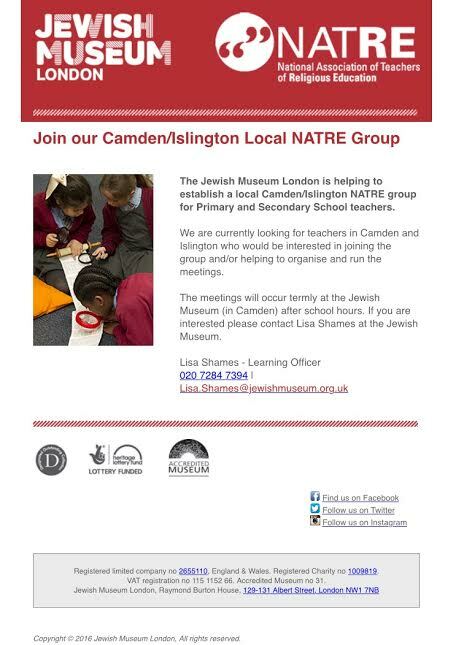 The NATRE group will be for Primary and Secondary teachers and hosted by the Jewish Museum. The group will be run by the teachers and the Jewish Museum will be available to provide administrative help with running the group. practice and have a support group in which to discuss ideas, activities, and plans. At the moment we are trying to gauge interest in the group and are asking anyone who would like to be involved or who would like to help run the group to please contact Lisa by 30th April 2016. Please see the flyer below for contact details and additional information. We are happy to publish guest blogs which promote better RE as long as they are not for profit. The LREH team's editorial decision is final. Laura Pope (@LPope_Teach_RS), Head of RE at Birchwood High, gives her perspective on new local RE groups being formed, following the success of the London RE Hub in March. Being a lone RE teacher I am always looking for new RE teacher friends, 'ooohhh friends'. After one failed attempt to start something in Hertfordshire and running my own event being pushed increasingly to the bottom of my to-do list things were not looking hopeful. Then I met Becky (@BeckyShahRE) over lunch at The London RE Hub in March: both there alone, both teaching in Hertfordshire. Like a giggly school girl I tried to play it cool and not follow her around too much for the rest of the day. Then came the waiting game. Should I follow her on Twitter? Will she follow me back? Finally it happened, we tweeted each other and creating a Hertfordshire local group was mentioned. Then Flora (@cupacoco) came along. Confident and organised she whipped us into shape. Emails started flying around and before we knew it we were talking 'face to face' via Google hangout. Mobile numbers swapped we were in business. Our email list got bigger with more joining via the RE East Facebook group and Twitter and we finally decided on a date. What was initially going to be a planning meeting turned into our first official TeachMeet event. So now I feel like that giggly school girl again waiting to meet a new class. Will they like us? Will we say the right thing? Will anyone turn up? 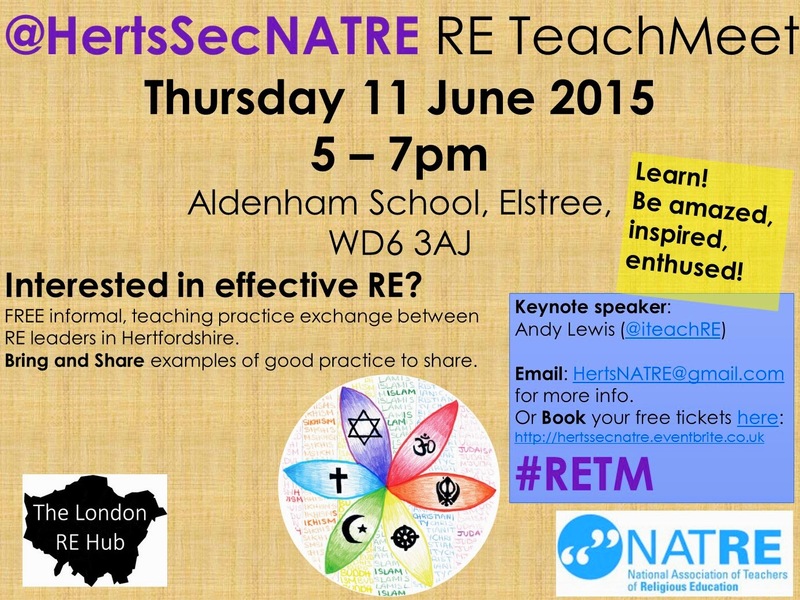 Come along on Thursday 11th June to #RETM find out! So, if we can do, so can you! If you’re hesitant about getting involved or starting your own local group don’t be. Put the feelers out on Twitter and via Andy @iteachRE and find a few local RE teachers. Then set a date to meet either online or in person. See where things go. For us, it’s been great fun already and we haven't even met in person yet! Keep an eye out for the next instalment after our first event! The London RE Hub’s inaugural conference was attended by over 100 London teachers and was a great success. Faith insiders, educators and other supportive partners offered a wide range of sessions, reflecting the scope, depth and richness of this incredible subject. 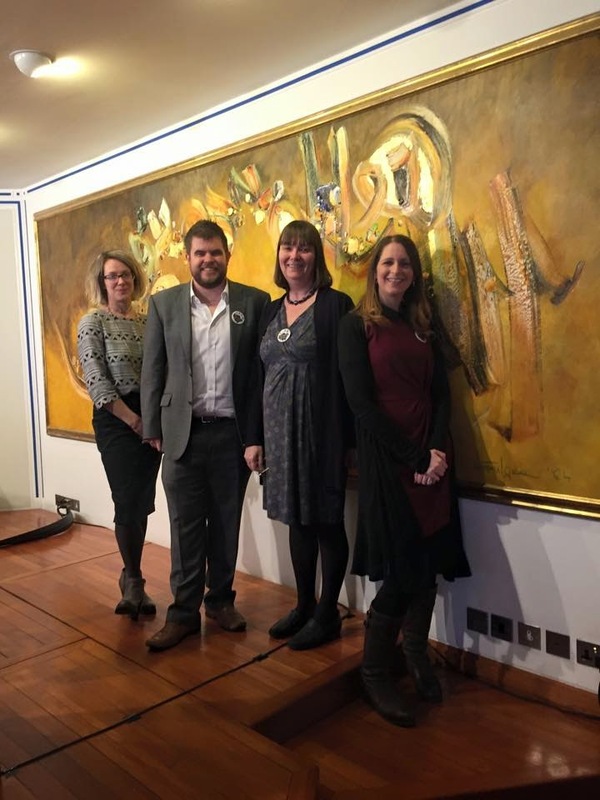 We are hugely grateful for the support given by Culham St Gabriel’s, NATRE and RE Today, as well as from True Tube, OUP, and Learn 4 Life, and are indebted to our amazing hosts at the Ismaili Centre. We would also like to say another thank you to our amazing speakers and session leads. Thank you so much. After such an amazing day, the key question faced by the team is "Where next?" Is this the best way to network and learn? What sessions would you like to see? What overall theme do you think would work? What are you willing and able to contribute to a conference? One of our aims is a strong commitment to affordability. Good CPD shouldn’t be beyond the reach of teachers and schools. We might be in straightened financial times, but we still have to learn and develop. Therefore we want to keep the cost of attendance at around £30. In order to achieve this for a second year running, the Hub must consider various options. The first is limiting time spent on admin; only allowing payment directly through Eventbright rather than invoicing achieves this goal. Do you foresee any problems with this? The second most important issue is who will run the sessions, manage the conference and provide quality control? Are you willing to be part of this process? Would one, two or three twilights over a year, focusing on one religion, be preferable to a day’s conference? What religion would you like to focus on? Would you be able to commit to all the twilights? Would you like to help organise twilights? How can we ensure suitability and usefulness of the content? This idea would enable Hub members to focus specifically on one faith and deepen their understanding. It would be a different commitment to an annual conference, but still requires organisation and time. The twilights would last for around two hours, cost around £10-15 including provisions, and would offer the same format as was launched at the conference: faith insiders exploring one ‘beautiful idea’ with teachers and educators. If you prefer this idea do you have requests/ ideas for what faiths? What venues and what to focus on? Would networking opportunities be lost without an annual conference? Technology exists which would enable remote teaching and learning. Is this a viable alternative for busy teachers? Would you prefer to learn in this way, or is networking in the ‘real’ world still important? The whole concept of the Hub was that everyone was a member and shared in the future of the Hub. We want your input, your suggestions, your ideas... and potentially your commitment! Any individuals or organisation is more than welcome to share in the vision. Please do 3 things to help us decide the future of The London RE Hub. Feet were thumping, shoulders were rubbing, tube doors were slamming and minds were spinning with curiosity. This was what was going on in South Kensington at 9:00am on Saturday 28th of March. The day had finally arrived. The London RE Hub Conference was taking place all day at the Ismaili Centre nearby, and many people had turned up to see what it had to offer. It was a day for teachers, promoters and supporters of religious education to get together and share ideas. These big, beautiful concepts formed the underpinning of the whole conference, weaving together numerous minds to form a range of new and exciting possibilities. I was privileged to be at the first London RE Hub conference at the beautiful Ismaili Centre on Saturday. Organised by the brilliant Andy Lewis and his excellent team, the event was attended by teachers, faith leaders and professionals with an affiliation to RE from in, around and beyond the capital. The day aimed to provide “authentic, useful subject knowledge” on faiths and non-religious worldviews. With an impressive line-up of scholars and speakers for each of the workshops, this objective was most certainly achieved. The session on Islam, jointly led by Imam Monawar Hussain (Oxford Foundation) and Deborah Weston (NATRE Executive), addressed common misconceptions about jihad and the distinction between its various forms. This was very timely in the context of the growth of ISIS and Boko Haram which has presented classroom practitioners with a huge and unenviable challenge, particularly when dealing with the subject of Muslims and conflict. What drives believers who identify themselves with a religion whose very name denotes ‘peace’ to cause maximal death and destruction in the name of God? It is a question that troubles subject specialists, students and Muslims themselves. Little wonder most of the delegates were seen sitting in this workshop! Imam Hussain traced the roots of Islamist terrorism to puritanical Wahhabism in the late 1700s, that was inspired by a vision of Islamic hegemony that bullies everyone into submission. However, this only goes so far. There is a deeper, and therefore less apparent, cause for the unspeakable horror we are witnessing in Iraq, Syria, West Africa and elsewhere. Is it Western foreign policy, or failed peace efforts in the Middle East? Not quite. The origins of this modern savagery are actually linked to Jesus. Perplexed? Then read on. Muslims, like Christians, expect Christ to revisit the earth - a belief based on prophecies contained in both traditions - to usher in an era of universal harmony and justice. Yet the image some have painted of the returning Messiah (who would be joined by the Mahdi) would make Abu Bakr al-Baghdadi appear benign. According to a literalist understanding of some hadith, when the son of Mary reappears, he will carry a sword, smash every crucifix in his sight and kill anyone rejecting Islam – liberating the ummah and making real the goal of an invincible global caliphate. Of course, to all who know and love Jesus as one who personified meekness and turned the other cheek, such a thought is intolerable. It is also a gross misreading of texts intended to be understood allegorically, and contrary to the Qur’an’s guarantee of freedom of conscience: “There is no compulsion in religion” (Ch 2: V 257). But for the young, impressionable and theologically illiterate, the idea of a ‘Jihadi Jesus’ is attractive, and to help pave the way for his second coming, some feel they must be ready to offer their lives. It is the highest form of sacrifice they believe will earn them eternal bliss. This deadly doctrine was challenged head on by a 19th century reformer, Mirza Ghulam Ahmad, who warned about the perilous consequences of belief in a bloody-thirsty Christ that was (and still is) prevalent among some sects. He predicted: “The beliefs of some… known as Wahabbis, regarding a bloody Mahdi and a bloody Messiah, are affecting their morals very badly, so much so, that on account of their bad influence their dealings with other people are not based on honesty and good will, nor can they be truly and completely loyal to a non-Muslim government." Ahmad emphasised that the Qur’an’s permission for armed struggle was solely for self-defence, at a time when persecution of Muslims had reached an extreme and the very life of Islam was under threat. In the 23 years of Prophet Muhammad’s ministry, approximately three months were spent in battle – illustrating how minor jihad bis saif (striving with the sword) was when conditions necessitated it. Those conditions do not apply today. This age, Ahmad explained, is for jihad bin nafs (striving with the soul) and jihad bil qalam (striving with the pen). Ahmad’s own claim as a divinely commissioned reviver of faith might not have been accepted by all of his co-religionists, but he was the first to directly address violent jihadist narratives. He cautioned other Muslim scholars and leaders that unless they did so too, movements like ISIS would inevitably flourish. So it was great to learn last Saturday that more than a hundred prominent Sunni figures worldwide, including Imam Hussain, are doing just that. They have engaged in an important jihad bil qalam and written a comprehensive open letter to al-Baghdadi to expose the theological baselessness of ISIS. The letter can be read here - http://www.lettertobaghdadi.com/ - and will also feature at a ‘United for Peace’ event at the University of Birmingham in May. It is a small yet significant step. And it is a jihad well worth supporting. So here goes my first blog…. Yesterday was the inaugural London RE Hub Conference held at the Ismaili Centre in South Kensington. Its aim was to support RE teachers subject knowledge and give practical examples of how lived religion might be taught within in the classroom. This is certainly what it did. I have come away feeling inspired, and have been reminded of the importance of rooting all I do in the classroom in the day to day lived faith of so many believers within our local communities and around the world. The conference also reminded me of concepts and information which took me back to my university days. However, in my 6 years of teaching I feel like I have too often just skimmed the surface of some religions. Part of me has come away feeling guilty, that I have let the busy nature of school life mean that my students haven’t had the depth of knowledge needed to truly understand the importance of faith to so many people. However despite my guilt, I have come away feeling empowered to make a change to the way I teach and always ensure my teaching is rooted in depth and challenge for my students. It was brilliant to hear first-hand from members of the Sikh, Jewish, Buddhist and Muslim faith but also to be given practical ideas for the classroom. I was particularly inspired by the session on Sikhism with Kate Christopher and Onkardeep Singh, perhaps because I know I am about to start teaching Sikhism to my Year 7s, but also because Onkardeep Singh gave me a genuine, authentic insight into Sikhism. He spoke of the importance of seeing God as your best friend within Sikhism and the role of mindfulness within Sikh worship, something which I don’t think I had really considered within my teaching of Sikhism. I also can’t wait to try out Kate’s idea of bringing in fairy cakes and icing them in the classroom and then giving them out for free at break time and getting students to reflect how this felt for them. This seems like such a fun and practical way for students to learn about sewa but also to discuss the value of this generous behaviour for individuals and as a part of worship. The day also reminded me of the importance of covering the diversity of religious faith; it was an excellent networking opportunity and it rekindled my love for RE. I’ve come away wanting make sure my students have a depth of religious knowledge which is rooted in the lived faith of so many individuals and communities around the world. How could the teaching of Judaism be improved in schools? How could the teaching of 'tricky questions' be improved in schools?